Thanks to the support and generosity of so many people, the Ewafe Project building is now complete and it is only a small bit of painting which is remaining. 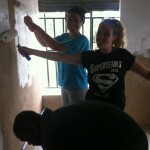 Last week, a group of us from Kids Club Kampala went to the Ewafe home to help paint the washrooms. 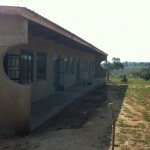 Ewafe, meaning “Where We Belong” in Luganda, was launched in June 2013 and building began in September. Kids Club Kampala created the Ewafe Home to provide a safe emergency shelter for children who have been abandoned, whilst either reuniting children with their families or finding permanent foster families for them. There are many projects that provide shelters to abandoned babies and toddlers but there is a lack for homes for older abandoned children. The Ewafe Home is approaching it’s final building stages and is almost ready to house the children. Our team on Wednesday began painting the washrooms in the Ewafe Home and we had a great time doing it!